LabourList readers believe that Theresa May’s offer to Jeremy Corbyn of Brexit talks was a trap – but say Labour should not walk out of the negotiations, our latest survey has found. Last week, the Prime Minister invited Corbyn for talks to “break the logjam” in parliament, following a series of ‘indicative votes’ that failed to produce a majority for any alternative to her own deal. Many Labour activists warned that this move was designed to “trap” the Labour leader – and almost 70% of our readers said they agreed with that assessment, according to our readers’ survey that attracted 4,546 respondents. 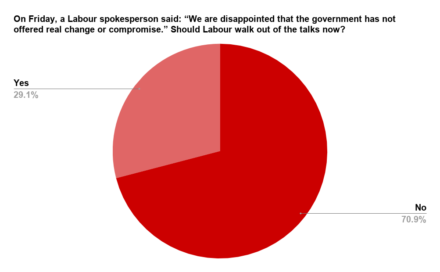 However, over 70% also said that Labour’s negotiating team should not walk out of the talks now. This is despite party figures reporting that the talks have not significantly progressed and a spokesperson saying on Friday that “the government has not offered real change or compromise”. The situation could change today as May is reportedly considering the Labour demand for a customs union in the UK’s future relationship with the EU, as well as measures that would ensure this could not be reversed by her successor. 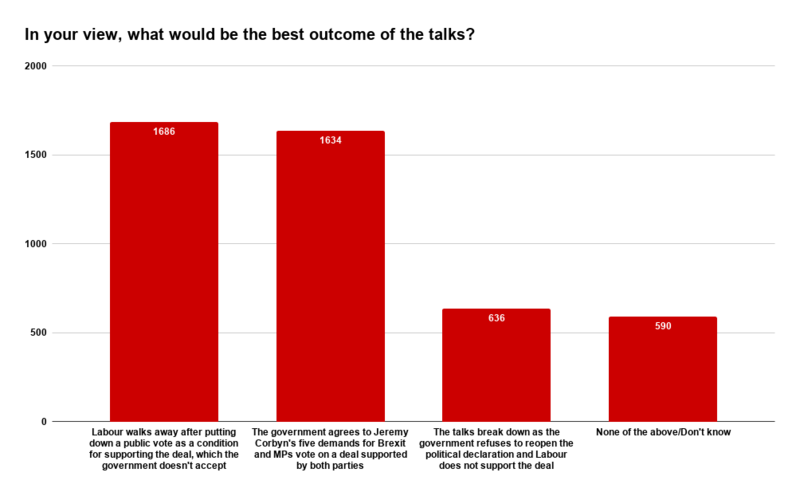 Asked about their preferred outcome for the talks, LabourList readers were divided. 37% of respondents chose “Labour walks away after putting down a public vote as a condition for supporting the deal, which the government doesn’t accept” as the best result. But almost the same proportion – 36% – opted for: “The government agrees to Jeremy Corbyn’s five demands for Brexit and MPs vote on a deal supported by both parties”. The issue of contention within Labour now is whether to lay down a public vote as a condition on any Brexit deal, even if the government agrees to change the political declaration such that it meets Corbyn’s five demands. 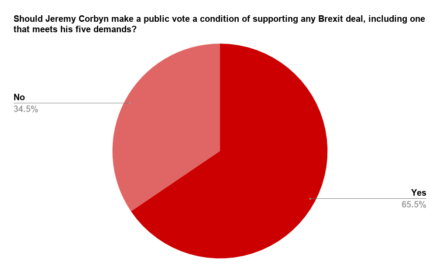 Following the same patterns as previous survey results showing that LabourList readers are overwhelmingly in favour of another referendum, 65.5% of respondents said Corbyn should make a public vote a condition of supporting any Brexit deal. 1. 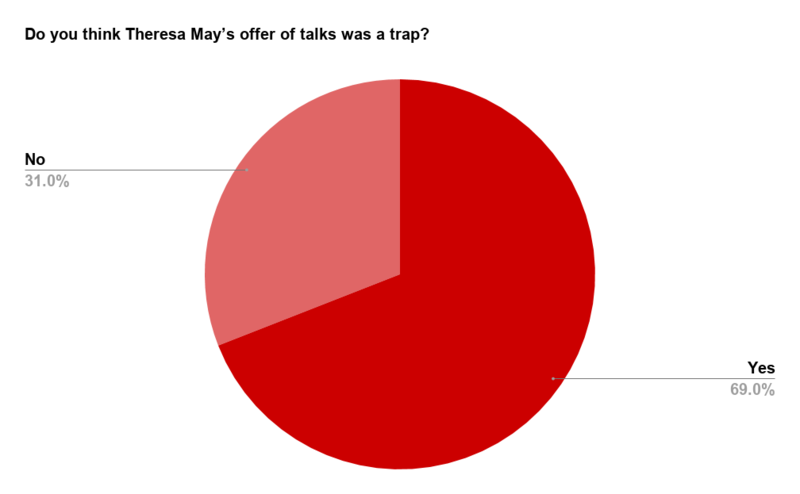 Do you think Theresa May’s offer of talks was a trap? 2. In your view, what would be the best outcome of the talks? 3. Should Jeremy Corbyn make a public vote a condition of supporting any Brexit deal, including one that meets his five demands? 4. On Friday, a Labour spokesperson said: “We are disappointed that the government has not offered real change or compromise.” Should Labour walk out of the talks now? The survey was open from 12.30pm on Saturday 6th April until 8pm on Sunday 7th April. Thank you to all 4,546 readers who took part.